Everyone talks about it, but by the time it comes down to actually making it I can’t find one good recipe. Except this one. 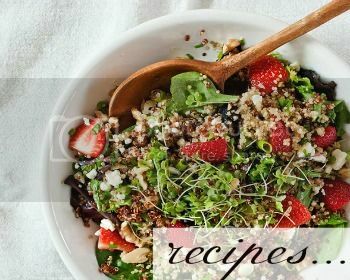 This Easy Peasy Quinoa Tabbouleh is basic enough to make with your eyes closed. I made it three different times yesterday. And not for any reason other than the fact that it’s insanely delicious and my friends kept wanting more post our Physique 57 workout. If I have the patience to make this three times in a row, then you can make it once (or twice). This is a great dish to keep in the fridge and serve with lunch or dinner…. Sorry for screaming, but I really felt that you needed to hear that. These bomb chocolate dipped banana pops are friendly to all kinds of people: vegans, vegetarians, kids, moms, teens, aliens, monkeys. You get it…. If you were stuck on a desert island and could only have two food items what would you choose? I would go with avocados and almond butter. Avocados are one of my favorite and most used foods (if you couldn’t already tell!). They’re so versatile and satisfying, plus you can find them almost anywhere in the world. This week I got creative and remade my favorite restaurant-worthy avocado toast right at home for you. It’s one of the easiest and healthiest snack or meal dishes out there, so you have no excuse not to try it out. I enjoyed this fabulous recipe with Dig Inn’s Fall Couscous Salad with Butternut Squash. Pumpkin seeds are nutrient rich and great for mid-day snacking, salad toppers, or even blended into your morning smoothie!